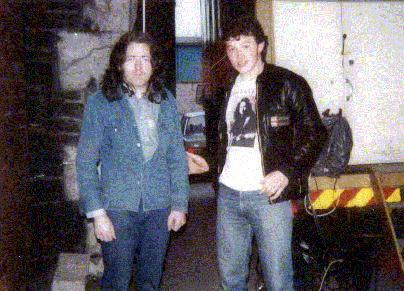 Cork-born guitarist, Rory Gallagher, was recently voted world's top guitarist in a pop opinion poll in leading British music weekly. Here he talks, via transatlantic telephone, to Evening Herald pop columnist Tony Wilson about winning the poll and his current tour in America. RORY GALLAGHER, voted the world's best pop guitarist, is taking his success very calmly. "I was surprised by the news," Cork-born Rory told me on the transatlantic telephone from his hotel in Los Angeles. "It's a nice thing to have happen to you, but I'm not worrying about it. It could change next week." Rory is on his third tour of America, having previously played there with Taste in 1969, and last year. In 1969 he toured with British group Blind Faith, which included Eric Clapton, one of the guitarists he defeated in taking the world guitar crown, and last year his group shared the bill with American drummer Buddy Miles' group. The present tour started out as a normal month's work - that was nine weeks ago! So successful has Rory been in America, on the Coast to Coast trail, that this tour will run for another four weeks. Rory told me that he first knew of his success in the pop opinion poll, conducted by leading British music weekly, Melody Maker, two weeks before the results were officially announced. Asked what the reaction had been like in American group scene circles about his being voted world's number one guitarist, Rory said that people had been very kind, and he had received congratulations wherever he played. This third tour of America could make him the most widely-toured pop musician from this side of the Atlantic. " Jeff Beck and his group toured here for 10 weeks," said Rory, " and that was considered a very long tour." The nine week stint has taken Rory and the group all over America, crossing and recrossing the continent playing clubs, concerts, college campuses and festivals. "It's the best way of doing it." commented Rory, who was sounding quite fresh despite the early hour in America. "We've completely covered the country, but we can only stay one more month because of the visa." Rory has found the American audiences falling into roughly two categories. Those at the concerts are described by Rory as being "pretty wild' and those at clubs "seem to be a purer audience. They applaud, but they don't go wild like the concert audiences. They are there more for the music than anything else." I asked Rory what effect the touring in America had on him as a musician. "It has an effect, although I find it hard to put into words. When you're touring, every night you're in a new place with a new audience. They expect something from you every time. The competition is fierce here, but it gets you into shape. "Sometimes on big concerts you only get about 35 minutes to play in, so you must play well from the start. That really trims you right." With so much traveling, wasn't Rory- and the rest of the group- feeling tired? "Well, it's not so bad," he answered. "We fly to a lot of gigs which isn't so bad as traveling by road. "After the first four or five weeks we've got our second wind. It's a psychological thing really. It's tiring, but we treat it as if we were touring in Europe." Rory feels he would like to have worked more in America. "The general reactions among the promoters have been good, in fact we could stay until Christmas if we wanted to. "I've learned a lot working here. But it also gives you an appetite for working in Europe again. "of course, being here gives us a chance to see some of our favourite artistes whom we might not see." Despite his success so far in America, and the added accolade of being named top guitarist in the pop world, Rory told me: "It's strange here because you can be highly rated in Europe and not mean a thing over here. They really look into your gut. You've got to fight them physically more than mentally." Some groups who have worked in America say that this has had an effect on their music, changing it and improving it. I asked Rory if this was the case with him. Rory thought so. He said that having a keyboard player, Lou Martin, a 22-year-old Belfast-born musician has made a lot of difference to the group's sound. "By the time we get home there will be a fair amount of difference, some new things with the harmonies in the group. There are certainly differences from the old line-up. The sound is funkier, more interesting harmonically and melodically with the keyboards." When Rory and the boys come back from America, there will be a short holiday for all of them and then its back to work again and into the studio to start laying down tracks for a new album. 'We hope to have the album recorded in November," said Rory, "and we'll do a few gigs here and there, but the last two months of the year will mainly be given over to working on the L.P."
Also coming up, in the New Year, visits to Germany, Denmark, Holland , Scandinavia and in March a major UK tour. Can Irish fans look forward to seeing Rory soon? "Yes, we shall be home for a few days at the end of December and we'll be playing some shows," said Rory. " I'm really looking forward to that."